U.S. President Donald Trump said Tuesday he will hold a second meeting with North Korean leader Kim Jong Un on Feb. 27-28 in Vietnam in a bid to break an impasse over how to rid Pyongyang of its nuclear weapons and ballistic missiles. The focus will be on whether Trump and Kim -- who made a vague denuclearization agreement in the first-ever U.S.-North Korea summit last June in Singapore -- can strike a deal to get North Korea to take concrete measures to dismantle its weapons programs under robust international verification. 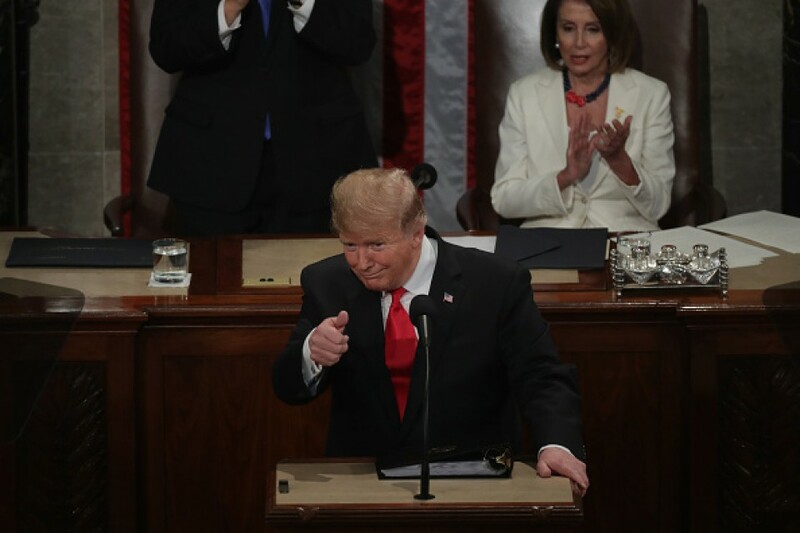 In a State of the Union address, Trump acknowledged North Korea has not conducted nuclear tests and missile launches for the last 15 months, but said, "Much work remains to be done" to address Pyongyang's weapons programs. "We continue our historic push for peace on the Korean Peninsula," Trump told a joint session of Congress. "My relationship with Kim Jong Un is a good one." The meeting comes as the two countries have remained at odds over ways to implement the agreement reached at the first summit, in which Kim promised to work toward "complete" denuclearization of the Korean Peninsula while Trump committed to providing security guarantees to Pyongyang. The two sides have shown few signs of narrowing their differences with the United States demanding that North Korea dismantle its arsenal with international verification and Pyongyang calling for a lifting of sanctions. U.S. and South Korean media have reported that to break the deadlock, Washington and Pyongyang may be contemplating an interim deal involving North Korea dismantling its main nuclear complex in Yongbyon in exchange for an easing of sanctions, such as exemptions for inter-Korean projects. The United States may also offer a declaration of a formal end to the Korean War, the establishment of a liaison office and humanitarian aid as part of confidence-building measures to facilitate denuclearization, they said. In his New Year's address, Kim said he is ready to meet Trump at any time, and promised that North Korea will no longer make, test, use or proliferate nuclear weapons -- though he did not touch on the existing arsenal. Kim also warned that he may have to seek a "new path" if the United States maintains sanctions and demands unilateral concessions. Pyongyang has demanded that Washington lift sanctions in response to its initial and unilateral moves toward denuclearization, such as dismantling its main missile engine test site and the only known nuclear test site, actions that have yet to be verified by international inspectors. U.S. Vice President Mike Pence has dismissed such a demand, saying, "We still await concrete steps by North Korea to dismantle the nuclear weapons that threaten our people and our allies in the region." Despite Kim's commitment to denuclearization, the U.S. intelligence community does not believe North Korea will completely give up nuclear weapons and other weapons of mass destruction. "We currently assess that North Korea will seek to retain its WMD capabilities and is unlikely to completely give up its nuclear weapons and production capabilities because its leaders ultimately view nuclear weapons as critical to regime survival," Director of National Intelligence Daniel Coats said last week. In an apparent repeat of Pyongyang's uses of denuclearization talks to extract aid and other concessions while covertly continuing development of nuclear weapons and ballistic missiles, Coats said, "We continue to observe activity inconsistent with full denuclearization."